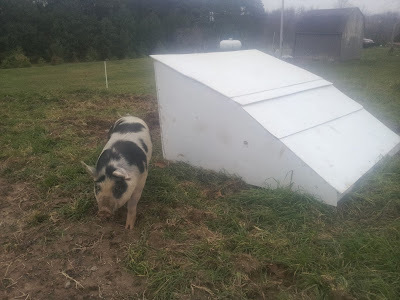 The Shire Farm: Shire Farm's Pasture Farrowing "E-Hut"
As winter was approaching this fall we knew we had to make a weatherproof, mobile shelter for the hog we selected to be our sow this spring. As we began our search, we looked for a Port-a-Hut style steel Quonset hut structure. This turned out to be hard to find and expensive. We then had a neighbor who was selling plastic tanks cut in half which would have worked very well, but again was cost prohibitive. 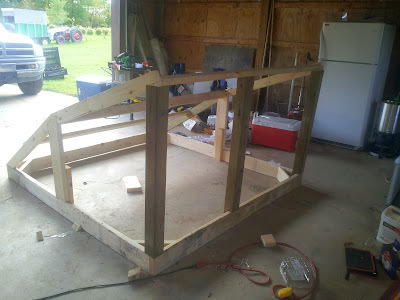 We decided to go with a more cost effective DIY home for our hog. Farmer Don found sketches and pictures of an "E-Hut" on an Iowa State University website. The total cost of the hut was under $200.00 for the lumber and the most expensive aspect were the exterior plywood panels. We've had a hard, cold and snowy winter thus far. The hut, or pigloo as we've taken to calling it, has proven itself and we are willing to recommend this hut as a winter house for a single hog. The last two weeks have been absolutely frigid here in Michigan, like much of the country. It reached it's peak on Monday last week when we hit -40 degrees F with the windchill and had got about 12+" of snow. All the while Arya (our sow to be) was snug as a pig in a blanket. 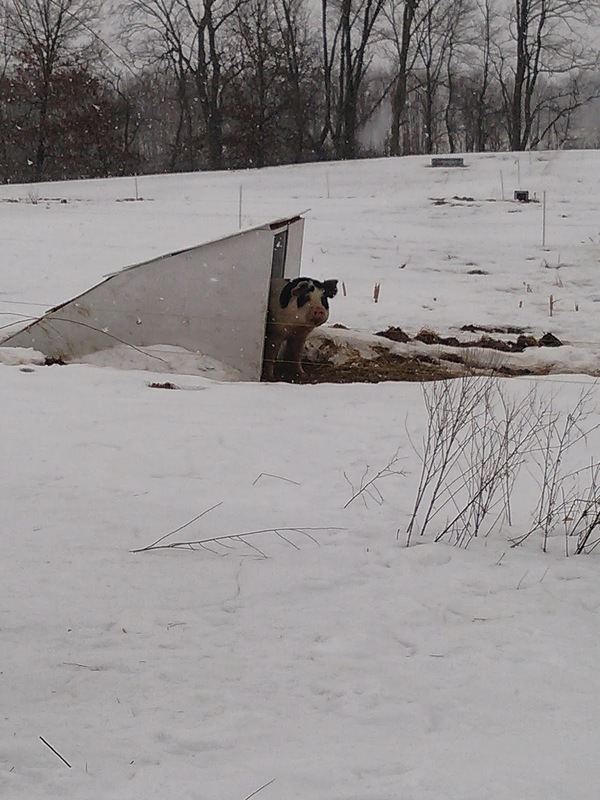 We've also shoveled snow up against the outside of the pigloo, an old trapper trick, to help further insulate the hut. 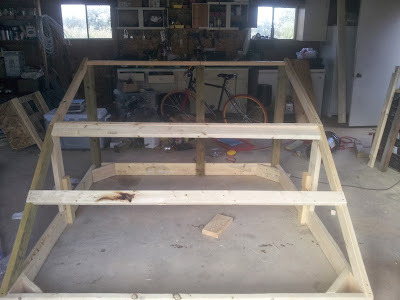 Here are pictures of the frame before adding the panels. I prefer to use untreated lumber. Yes I know it is going to rot, but treated lumber is not really safe around the animals or garden soil that this will at some point be sitting on. Really it's not safe for humans either if you were going to rub all over it and sleep against it. 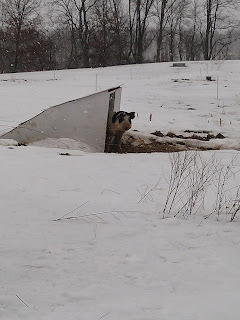 Here, the hut is in the field, off the side of last year's vegetable garden. We stuff a few straw bales in there, especially when it is cold and Arya keeps herself very warm in a nest of straw. There is also a slight gap at the top to allow warm, damp air to vent out of the hut helping to keep her dry. As you can see the back overlaps itself, letting water drain down off the back rather than into the hut. 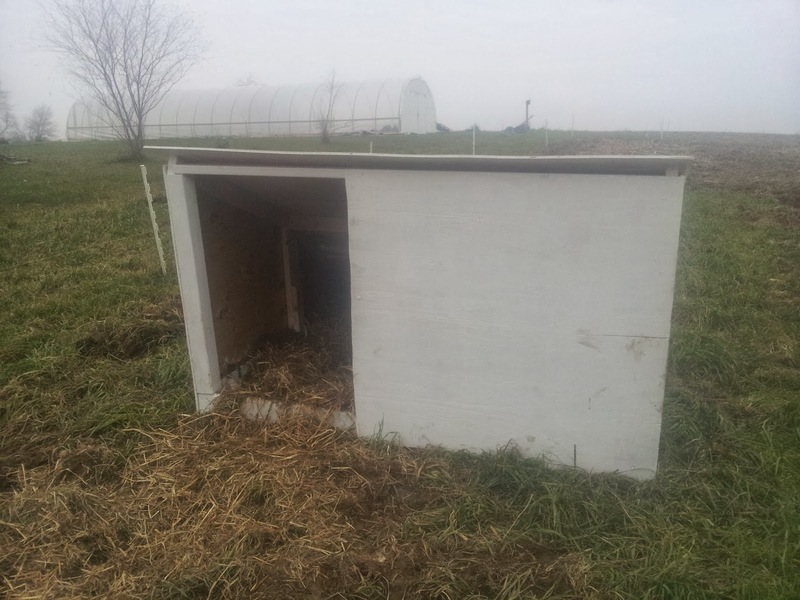 The middle panel can be lifted off both for ventilation, and for nabbing piglets from a protective mother for castration. Our sow at this point was likely about 350 lbs+ as a size comparison. If you have any questions about our hut's construction, feel free to check out the rest of the plans on the Iowa state website, or contact me about how I constructed mine! We'll be doing artificial insemination on our sow in February, for piglets in May. 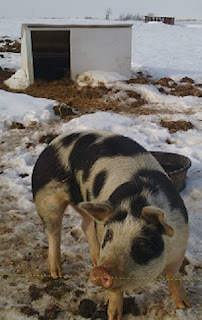 Then we will be moving the hut closer to farrowing time to their pasture for next year. We'll report back with an update on how the Pigloo works for farrowing piglets in! looks pretty good. I like the slopped back. That would make it easy to add sow rails. I am with you on the treated wood! Especially around animals. A lot of people don't think about it but that animal is going to chew and rub on it and then their body is going to either soak it in or expel it back into the ground and help contaminate your pasture. Either way you'll end up eating the chemicals in the treated wood. I have found raising things to where I only have two or so boards touching the ground and coat the wood in a natural paint or oil it does slow down the rot. The Shire Farm's First Calf!